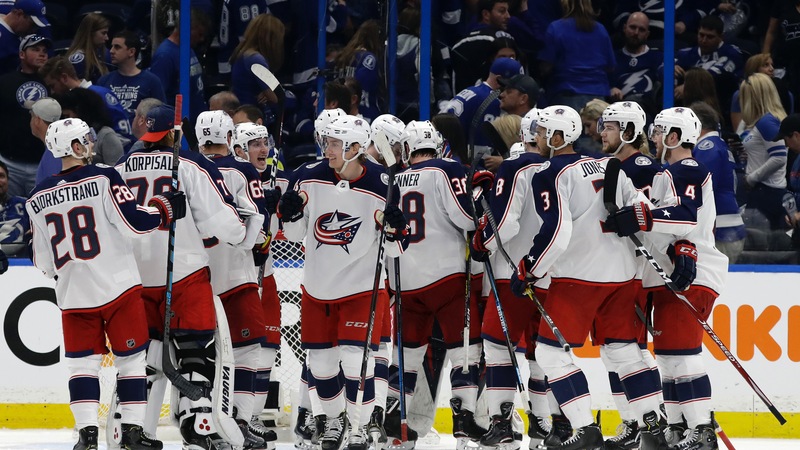 Tampa Bay lost only seven home games this season in regulation, but visiting Columbus, a hefty underdog, took Game 1 of their Eastern Conference quarterfinal series after being down big early. The Lightning lost only seven home games this season in regulation, but visiting Columbus, a hefty underdog, took Game 1 of their Eastern Conference quarterfinal series Wednesday night, [4-3](https://www.thescore.com/nhl/events/21613). ## Lightning-Blue Jackets bad beat Tampa Bay (62-16-4 in the regular season), which finished with 128 points ([fourth-most in league history](https://records.nhl.com/records/team-records/standings-points/team-most-points-one-season)), opened a 3-0 first-period lead behind goals from Alex Killorn, Anthony Cirelli and Yanni Gourde. But the Blue Jackets, who closed as +205 underdogs at the Westgate SuperBook (the largest they've been all season), scored four unanswered goals, including Seth Jones' game-winner on a power play with less than six minutes left. Columbus (47-31-4), which secured the final playoff spot in the East on the penultimate day of the regular season, tied it on Josh Anderson's shorthanded goal with 8:06 to play. __MORE:__ [Finding value in Stanley Cup futures](https://www.betchicago.com/finding-value-2019-stanley-cup-futures) | [Stanley Cup series odds](https://www.betchicago.com/nhl-stanley-cup-playoff-series-odds-knights-sharks-2019) <a href="https://youtu.be/LL2jKGvyC8Y?t=210" class="embedly-card" data-card-width="100%" data-card-controls="0">Embedded content: https://youtu.be/LL2jKGvyC8Y?t=210</a> The game-winner put the game OVER its 6.5 total, but that was already assured once the Blue Jackets tied it, because playoff games can't end in a tie. Columbus goalie Sergei Bobrovsky made [some excellent saves](https://youtu.be/LL2jKGvyC8Y?t=137) in the second period and early in the third to keep it a two-goal game. The Blue Jackets, who won seven of their last eight regular-season games, are the 27th team to win a Stanley Cup Playoff game in regulation after trailing by at least three goals, according to the Associated Press. Tampa, which was a -230 favorite for Game 1, was [-400 to advance](https://www.betchicago.com/nhl-stanley-cup-playoff-series-odds-knights-sharks-2019). The Lightning were also 3-0 against Columbus in the regular season, outscoring the Blue Jackets 17-3. Game 2 at Amalie Arena is scheduled for 6 p.m. CT Friday on CNBC. __PLAY:__ Our [free daily contests](https://betchicago.chalkline.com), including [NHL Pick 6 Playoff Challenge](https://betchicago.chalkline.com/games/nhl-pick-6-playoff-challenge), for the chance to win a BetChicago prize pack.